A barge carrying a crane to be used in the dismantling of the old Waldo Hancock Bridge in Prospect is pushed down the Penobscot River near Winterport on Tuesday. A barge carrying a crane to be used in the dismantling of the old Waldo Hancock Bridge in Prospect rounds a corner in the Penobscot River near Winterport on Tuesday. A 250-by-75-foot barge cruises past Bucksport en route to the Waldo Hancock Bridge, where the 262-foot crawler crane will lower pieces of the bridge to shore in a massive project to demolish the bridge, expected to end in July. 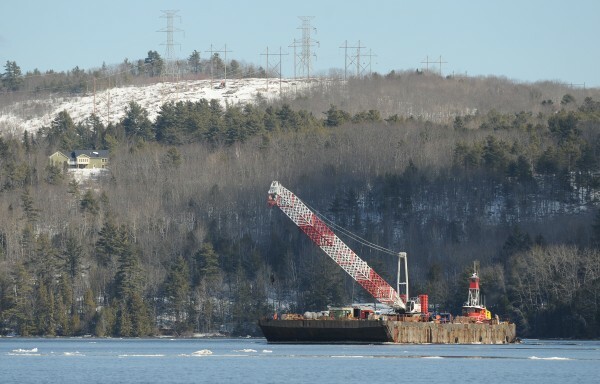 VERONA ISLAND, Maine — A barge carrying a massive crane traveled down the Penobscot River from Brewer and arrived here Tuesday, marking the beginning of the end for the 81-year-old Waldo-Hancock Bridge. Escorted by a tugboat, the 250-by-75-foot barge and its cargo — a crawler crane with a 262-foot boom — is a critical element in the deconstruction of the bridge, which spans the Penobscot between Verona Island and Prospect. “This is the phase, now, where we can start removing the bridge deck and the trusses,” said Ted Talbot, spokesman for Maine Department of Transportation. The barge set off from Cianbro Corp. in Brewer in the morning and arrived at Verona Island around noon. An impending snowstorm is a factor in determining when the first piece of the bridge will be lowered to dry land below, but Talbot said demolition will begin as soon as weather permits. Though the barge’s arrival means deconstruction can begin in earnest, observant motorists will have noticed a large section of the bridge’s deck, on the Prospect side in Waldo County, has been gone since early December. The span of steel and concrete was the first piece of the bridge removed by a demolition crew from S&R Corp. of Lowell, Mass., which began the gargantuan deconstruction task last fall. The bridge, which spans the Penobscot River between the Hancock County town of Verona Island and the Waldo County town of Prospect, was built in 1931. Because of its deteriorating condition, the state decided to replace the bridge in 2003. The towering new Penobscot Narrows Bridge was completed in 2006, ending the elder structure’s 75-year tenure. S&R Corp. submitted the low bid of $5.35 million last year, and was awarded the demolition contract by the state. The barge, which originated in Staten Island, N.Y., was first brought to the Cianbro facility in Brewer, where the crane was installed. Talbot said that while the vessel is large, it won’t obstruct maritime traffic on the Penobscot. The barge is outfitted with navigational lights and the channel, like every other in the country, will be managed by the U.S. Coast Guard, which will direct traffic. The deconstruction of the bridge has become somewhat of a spectator sport. At Fort Knox on Tuesday, motorists arrived with cameras in hand to watch the barge’s arrival. Despite the eager gawkers, Maine DOT does not expect traffic to be affected by the massive project, which is expected to end in July.